Welcome... to Blogtobia. 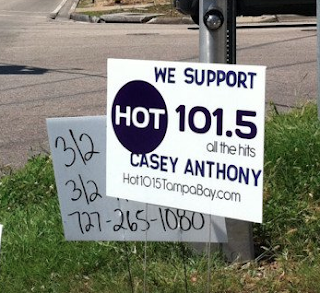 : Radio Station: We support Casey Anthony! A local radio station in Tampa Bay has aligned themselves with acquitted murderer Casey Anthony, who was just recently found not guilty of the murder of her daughter, Caylee, and who is literally the most vilified woman in the United States today. "I just can't believe any radio station in Florida, let alone in Pinellas or Hillsborough Counties, would openly support Casey Anthony as such," said American radio presenter Toby Knapp. "It's just not very well thought out, and it's certainly not in touch with the people of the bay," Knapp added. It's a strange move for a new radio station in a highly competitive marketplace to align itself so closely with a person so hated. Taxpayers in the new radio station's market just found out that they'll be footing the $150,000 bill for Anthony's legal defense, which essentially means that the taxpayers of the market - and the state of Florida - have paid to get a woman whom many think to be a convicted murder - off scott free. "This isn't the work of a radio genus, it's the work of an assclown," Knapp said of the apparent "axis of disgust" alliance in Tampa Bay. "This makes anyone who loves justice stomach turn."